The early English safes were just strong wooden boxes which were bound up with iron hoops. A specimen thought to be about 1,000 years old is in the Cathedral of Chichester. By the end of the 18th century, cast iron chests, as well as book safes that had both single and double doors, were introduced. This was abandoned because it didn’t afford any security. It wasn’t until the 1840s the safes which could protect from the fire were marketed by safe manufacturers. Built by Thomas Milner in about 1827, the safes’ alum melted in case of fire and the dampened sawdust which lined the inside prevented the conduction of heat to the inside of the safe. In 1833, C. J. Gayler patented a double fireproof chest in which one was within the other and had space between them to enclose non-conductors of heat. It passed a public test as well which gave it the name ‘Salamander’. It was advertised by safe manufacturers as weighing in between 300 to 5,000 pounds. But none of the safes which got marketed through the 1830s could provide reliable protection against intense fires. In 1837, Benjamin Sherwood got a patent for a revolving interior cylindrical safe which was a bigger revolving cylindrical safe within and space would be filled up with charcoal and plaster of Paris. In 1839, Thayer & Edwards of Boston presented an iron safe at MCMA exhibitions and then subsequently in 1841 and 1844, they showed “Salamander Safes” at the same exhibition. Starting from 1830, Daniel Fitzgerald thought of using a thick coating of plaster of Paris as an insulating material. He was finally granted a patent in 1943 but it passed hands till it came to be known as the ‘Wilder Patent’ and was fruitful in fire resistance. 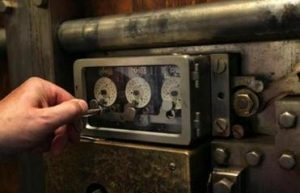 The commercial production of safes using that Wilder technology began in 1840. Various safe manufacturers between 1840 and 1860 produced the fireproof salamander safe. The story further on gets more interesting, as parties named Rich & Co., made an improvement on the Fitzgerald model and patented it, which saved properties of those who had it in the great fire of 1845. But over time it was found that plaster of Paris overtime made the interior moldy, damp and rusty. So in 1852, Spears discovered an alternative to this which was used in 1854 by Herring. 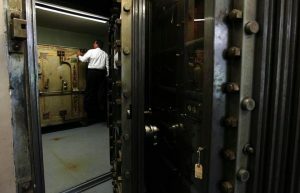 In 1833, a burglar-proof safe was patented in England by Chubb. In the middle of the 19th century, Lillie’s safe was in the used for this very purpose by using dense slabs of the chilled cast iron. But the burglars were able to drill into it over time. Later on, Messrs. Herring & Co. A few years later used a boilerplate wrought iron to make their safes, used Franklinite, steel rods, and more things as well. This proved to be the most efficient way to thwart burglaries.